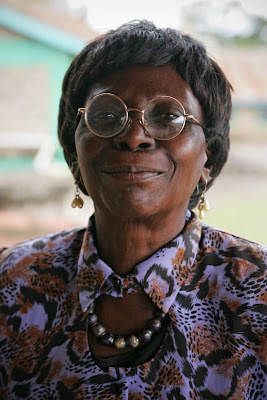 When i first met Gloria back in 2008 i was instantly struck by this mama who is an older version of Whoopi Goldberg. She had style. Always dressed to the nine's and sporting her latest jewellery invention i always have to smile when i see her. As Gloria and i sit down to talk we discuss her health. For the last 3 weeks she has been battling with Malaria, a common thing to get but at her age and with the mixture of it and the ARV's, it can be deadly. She is glad to be healthy and working again and tells me that she feels idle since she has not worked in three weeks. She laughs when she explains that her husband hasn't worked in three years and still doesn't feel idle. With a sigh explains that is the difference between men and women. When Gloria first came to Kawangware in 1974, 10 years after Kenya's independence, it was mostly bush and wasn't populated but now it has just under a million residents. The streets have become unsafe and living daily is a problem for all. Regarding the constitution, she says that she cannot worry about what may or may not change. Not to misunderstand her though that she voted and will remain political, but that there are always things promised and always things not given. If Kenyans only dwelled on that and not living day to day then the country would not run. It's better to focus on what needs to be done right now and go from there. Change will come, but no one knows when or what will be changed until it happens. She sits a bit taller, moves her blouse around and then declares we are done and now she would like to discuss her earrings.